The name of this dish comes from the vessel it was traditionally cooked in - a flat-sided unglazed earthenware dish with a tight-fitting conical lid - a tagine. But don't be put off making this amazing Moroccan stew if you don't have a tagine to cook it in. You can make it perfectly well in a casserole dish, dutch oven, stockpot, crockpot or slow cooker. Traditionally it would be cooked in the embers of a fire, but these days you can do it on your stovetop or in your oven. Rub the ras el hanout (a moroccan spice mix) all over the lamb. Cover and leave to marinate for a few hours if you can, otherwise don't worry about it. Peel and chop the onion into about 1cm (half-inch) squares. Heat a good glug of olive oil in a heavy frying pan on medium heat. Sauté the onions for about 10 minutes - a little browning is OK. Peel and finely chop/mince the ginger and garlic. Add them to the onions and cook for a couple of minutes. Add the canned tomatoes (finely chop them if they're whole) and the chick peas. You can use uncooked chick peas in this, but you would need to soak them for an hour beforehand. Chop the preserved lemon into rough slices, add it to the pan and let everything cook for another 5 minutes or so. If you are using a tagine or casserole dish (with lid), preheat your oven to 180°C (356°F) for a fan oven, 200°C (392°F) conventional, or gas mark 6. Place half the contents of the frying pan into your cooking vessel, put the lamb on top of it, then pour the rest of the sauce over it. Add a tight-fitting lid and place in the oven for 2½ hours. Or put your pot on the stove, bring it to the boil, then simmer gently with the lid on for 2½ hours - checking ocassionally to make sure it's not sticking to the bottom - add more water if it looks like it might stick. If you're using a slow-cooker, it will need at least 6 hours. Serve with flatbreads or couscous. The video above is from the Keef Cooks YouTube channel. 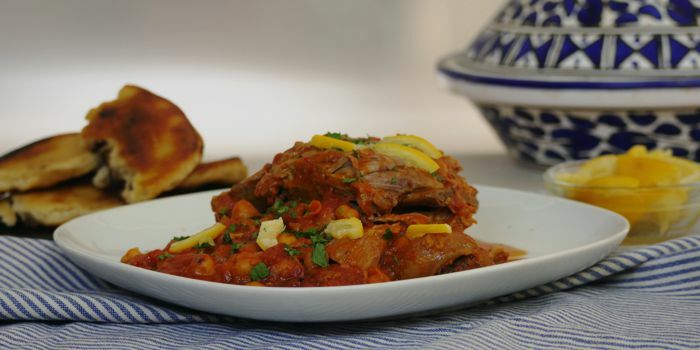 Click here to see the video recipe of Lamb Tagine on YouTube. Olive oil for sautéeing. Chopped fresh coriander (cilantro) and finely sliced preserved lemon to garnish.